You are currently browsing the category archive for the ‘Bento’ category. 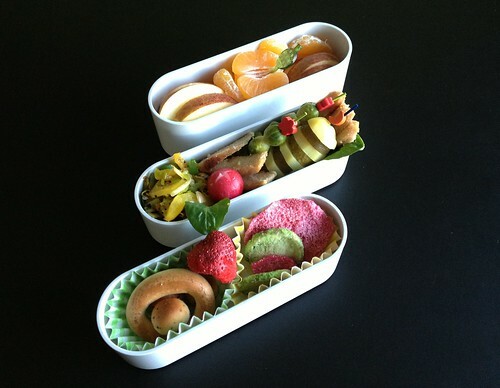 Curious about the contents of this bento? Mihoen (bihun) goreng with faux chick’n leftovers from Soy, my local Chinese vegetarian restaurant, topped with fried courgette and parsley. 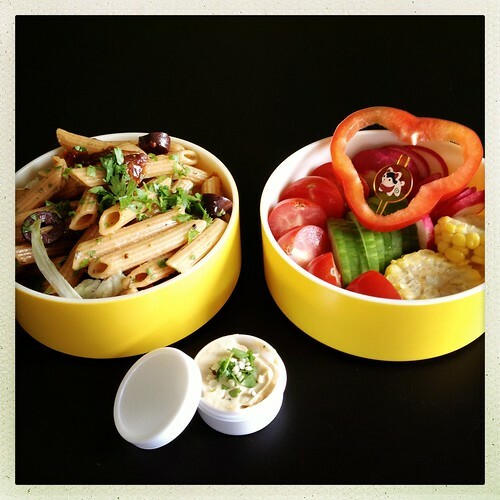 Red Batavia lettuce, tomato, creamy borlotti-balsamic bean spread (recipe from Think! Eat! Act! 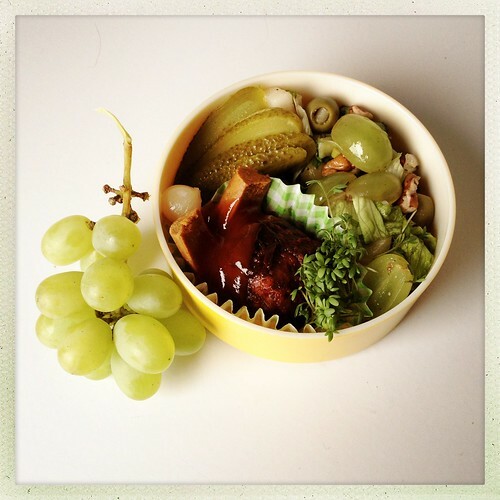 A Sea Shepard’s Chef Vegan Recipes by Raffaella Tolicetti), pickles, kalamata olives, and a spoonful of capers. I won the Sea Shepard’s vegan cookbook I few months ago on Lisa’s Project Vegan blog and the recipes I’ve tried so far are all thumbs up! I hope to spend a post on the book sometime soon so I can link it up to Trish’s Cook It Up — but let’s not get ahead of myself. I used local borlotti beans out of our organic CSA haul for the bean spread this past weekend. Other local and organic ingredients in this lunch are zucchini, lettuce, tomato and parsley. 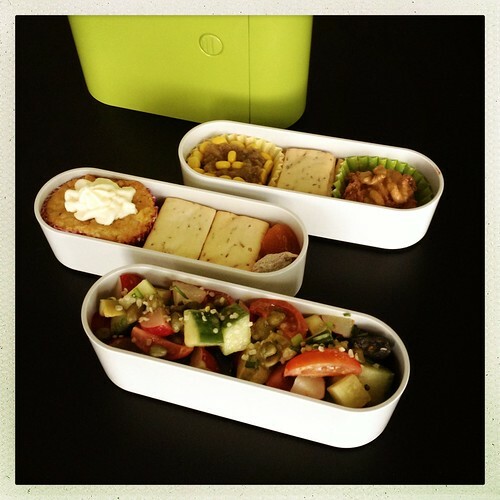 I hope I’ll be presenting my next bento again soon… See you then? This office lunch bento no. 208 is in African-Eastern style. I used leftovers from dinner I made following recipes from the Cookbook Challenge #1. Remember I said there were a few more recipes I wanted to try from the Modern Moroccan cookbook? 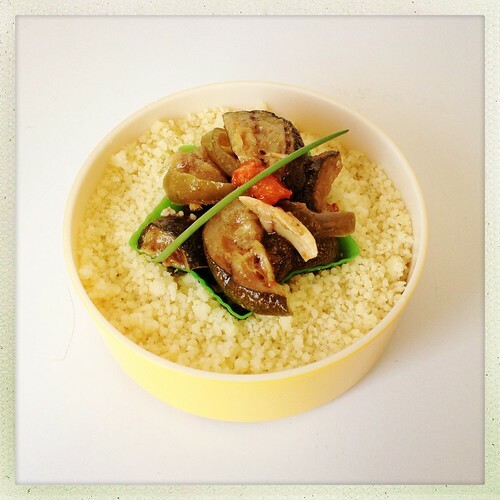 Well, this box contains creamy couscous, agave-roasted courgette and home-made harissa. All delicious. :) Especially the couscous was surprisingly good. The other tier is more… fusion. It holds some gherkin and pickled onions, mixed green salad with lemon olives, grapes, pecans, garden cress, fennel and spring onion. There’s onion bhajee with tamarind sauce in the paper cup (Indian takeaway) and a small piece of veggie dog with tomato ketchup. Some more seedless grapes on the side. 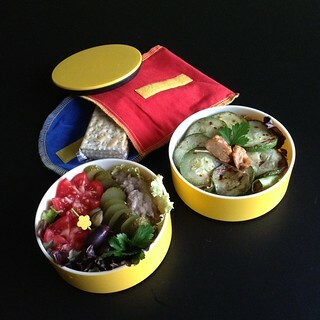 Have you made any bentos lately? 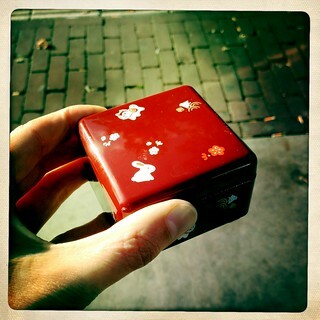 On Wednesday I made my first bento in almost two months… I had a movie date in Amsterdam with my friend Loes. We went to a special viewing of the classic 1983 Palm d’Or winner The Ballad of Narayama (Narayama bushikô), a film by Shohei Imamura. Last week was the Dutch première -yes, after 30 years!- and there are only a handful of screenings. The Ballad of Narayama is an unusual movie: at the same time pretty much “in your face” as well as burlesque — the latter possibly to soften the hardships of life that are shown. But it’s also something I’ve come across before in Japanese cinema. Isn’t the sometimes caricatural play not reminiscent of kyōgen theatre and kabuki? Anyway, I enjoyed myself regardless of the slow pace. The many images of nature are gorgeous and it’s interesting to witness how life in a poor Japanese country village may have been in another age. I was touched by the way Orin’s son was torn between his unwillingness to let his mom go, and not wanting to shame her by refusing to go along. His difficult journey into the mountains felt like a period of mourning and Orin’s first-born carrying her to her death mirrored the process of her giving birth to him. The cycle of life. The title of the film refers to a song about Orin’s life stage made up by her grandson in the beginning of the story (wintertime), recurring several times until The End, on the threshold of another winter. Contemplating this I seem to have a theme going in my life at the moment. My current book is Wild by Cheryl Strayed, relating of her experiences hiking the Pacific Trail Crest (PCT) in her early twenties, a few years after her mother died. I’m totally absorbed in the story and can’t wait to read on. But first it’s time to get back to the subject of this post. 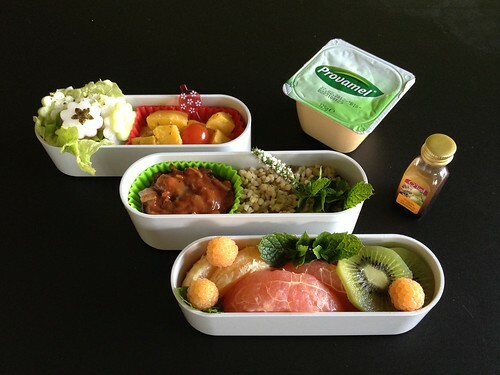 I was travelling to the cinema at dinner time so I’d eaten a hearty lunch earlier that day and made myself a simple dinner bento to have on the train. Aubergine caviar with corn kernels, Italian crackers and walnut spread. Lemon macadamia cupcake with lemon frosting (recipe from Vegan Cupcakes Take Over the World), more crackers, dried apricot and baby fig. Cucumber salad with mini plum tomatoes, olives, radishes, chives, a cheezy dressing (recipe from Bryanna Clarke) and hemp seeds sprinkled over. Submitted to What’s for Lunch Wednesday #145 and Beth Fish’s Weekend Cooking. 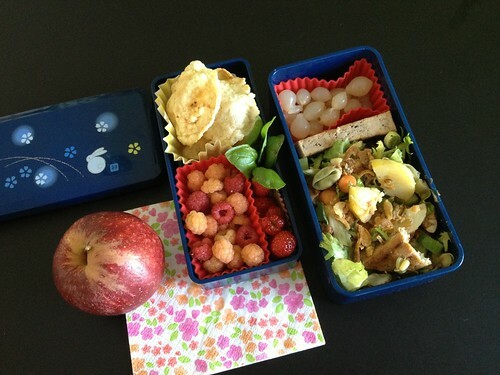 A quick share of my most recent bento. It contained leftovers from our “yogi dinner” the previous night: recipes from the cookbook Yogifood1 by Jet Eikelboom and Seth Jansen. Yogi lentil salad with hazelnuts, parsley, red cabbage, corn lettuce and a maple-balsamic dressing, mini plum tomatoes, cucumber, carrot, and more tomato with almond butter dip from my Lithuanian Foodie Penpal, yogi potato mash with thyme and a sea-buckthorn candy from my visit to Vlieland. On the side: 2 clementines, santana apple and 3 sandwiches (apple-pear butter & houmous). Local/CSA: corn lettuce, cabbage, carrot, potato, thyme, apple. Office lunch on Thursday 13-12-2012. On Thursday I enjoyed an office lunch with several of the Lithuanian goodies I got from my November Foodie Penpal Vita. 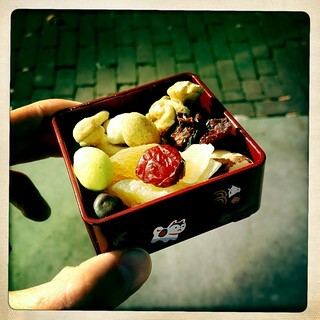 The box up front contains both the kūčiukai and cookie rings (yay, cookies to add carbs to my bento ;) a freeze dried strawberry and candied radishes. The middle ‘meat & veg’ tier holds some onion-leek-garlic-pepper (yellow & green) stir-fry, slices of Healthy Planet “chicken” fillet, a fresh radish, mini Brussels’ sprouts and a skewer of sliced raja potato and gherkin, all on a bed of corn salad. I also brought a small container of tomato ketchup for the faux meat but forgot to include it in the picture. Dessert comes last of course: apple & clementine. I didn’t mean to cross the bento-200 line so silently… Alas, I lacked the time to post numbers 200-202 but plan to make up for that later this month! Join us with a food related post in Beth Fish’s Weekend Cooking! 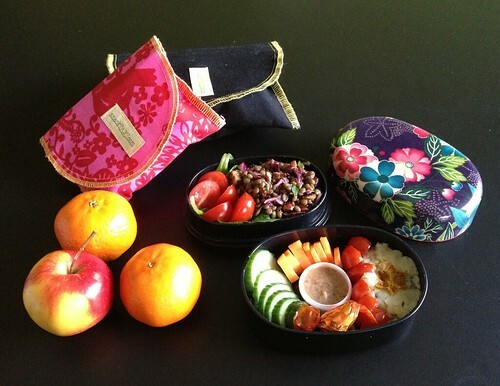 I had planned a nice bento in orange colours last week, but unfortunately I had to skip it. But here’s a green one today instead! Pasta salad with avocado sauce, peas, corn & sun-dried tomatoes, escarole and tiny tomato from the balcony. Pecans for the salad, courgette fritter, cucumber to dip in spicy houmous, and (Gnoe getting frivolous here ;) gherkin hearts. Gingerbread with soy margarine & agave syrup and fruit salad for dessert: apple, satsuma and mango in a lemon-ginger dressing with cinnamon. I’ve been looking for a good pasta salad recipe and now I’ve found it! I use Chloe Coscarelli’s avocado-pesto sauce, either leftovers of dinner like today, or made afresh. The sun-dried tomatoes are a must but for the rest it’s just what I have at hand. Made it with young broad beans once — ’t was great! Red Batavia lettuce, French onion, cucumber and radish flowers finished off with African Peper Mix, salt, yuzu powder and nori cutting. Nooo, I did not do that by hand. ;) Oven-roasted butternut squash with coriander seeds in the cup, and a tiny tomato from the balcony. Seitan stroganoff and minty leek bulgur with a fresh mint blossom. The fruit tier: kiwi, red grapefruit, orange and home-grown yellow raspberries with a bundle of mint. Dressing for the raw vegetables and more proteins: a soy caramel dessert. 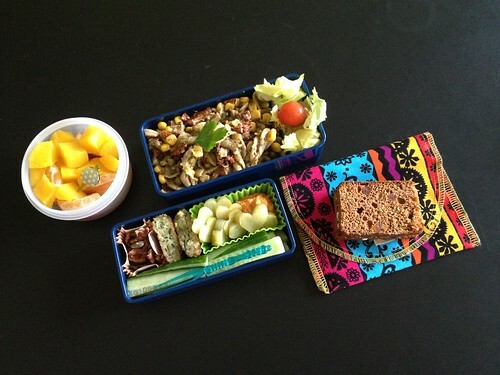 This bento mostly consists of leftovers: the seitan, grains and pumpkin were all on the menu the past few days. The citrus wedges I put aside yesterday when I was having a bowl of fruit. So you see: it really doesn’t have to be a lot of work! Now, maybe you’re wondering what happens to the cut-off pieces of crudités — I know I used to when I was a beginning bentoïst! But there are several solutions. You can snack on them while compiling your bento. They can be placed in an airtight container and refrigerated until evening or the next day, when you can throw them in a salad, soup, tofu scramble, stew or whatever.